Blu Ray Review - "Faster"
Immediately following his release from prison, a convict (The Rock) known only as "Driver" walks into an office building and shoots a cubicle-dwelling employee (Courtney Gains). When a detective named Cicero (Carla Gugino) and an aging officer referred to as "Cop" (Billy Bob Thornton) pick up the case, they soon discover that Driver was once the driver (shocking, I know) for a crew led by his brother (Matt Gerald). After their last heist, which put Driver in jail, they were ambushed by another group who stole their ill-gotten goods, slit the brother's throat, and put a bullet in the back of Driver's head, an injury from which he miraculously lived through. Now armed with a list of all those involved with his brother's death, Driver is out for vengeance, two steps ahead of the cops and only one step ahead of a hired killer (Oliver Jackson-Cohen) intent on bringing him down. It's no secret that I'm not a fan of The Rock. I'm learning, however, that my dislike for the guy has more to do with the roles that he gets shoehorned into. If he's asked to be just an action star, I can dig him. If he's asked to make me laugh, however, I want out immediately. So in essence, "Faster" is the perfect movie for him. I mean, his character doesn't even have a name! How could he not excel in that setting? The result is a perfectly reasonable, "It's late and I still have some work to do and I've already watched Sportscenter twice so I'll watch this" action movie. I actually enjoyed it and I didn't really expect to. It's absurd, of course, and contains a fair number of action movie cliches that were beaten into the ground long before 2010 rolled around. 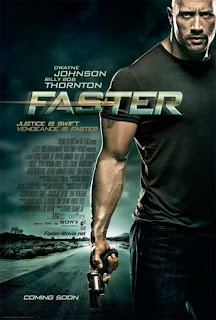 But as far as action sequences go, "Faster" brings the goods and even implements a few unexpected touches (Killer, in particular, is a cool concept in theory) that add to the experience. What keeps this from being a "B" or "B-" in my book is the use of the aforementioned Killer. An exceedingly interesting character who has made billions in the technology industry and takes only $1 for each of his hits, Killer is never developed properly. He and his girlfriend, Lily (Maggie Grace), take up a prominent side plot in "Faster" but ultimately do nothing but allow time for Driver to get from one victim to the next, like a bad "SNL" bit that sits between two elaborate (and better) sketches. I was left to want either more or less of Killer; either leave him in the shadows and allow him to stay a mysterious figure or fully flesh out his character in a manner that is more fitting of his potential awesomeness. Instead we get the middle ground which was a real bummer for me. Still, though, if you're looking for an adrenaline-filled 98 minutes, you could do a lot worse than "Faster."